ADULT: Wingspan 12-16mm. 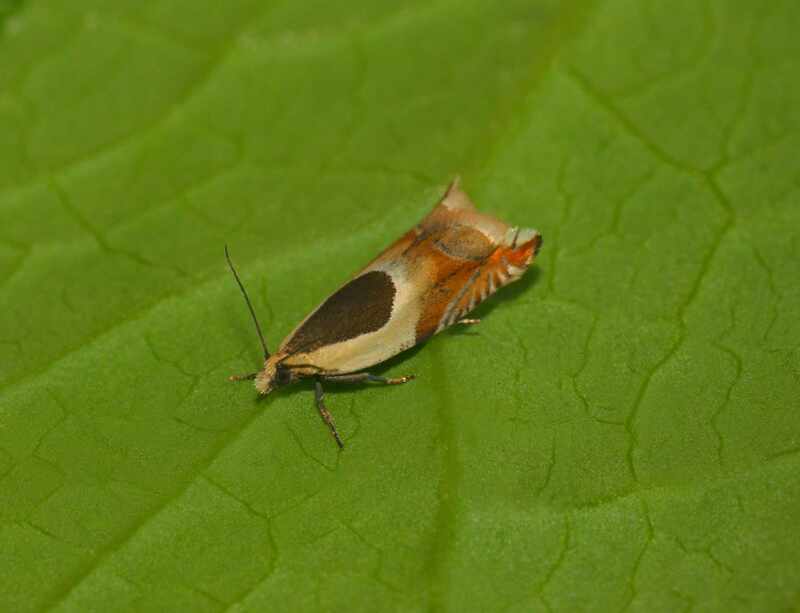 A tidy little micro moth best identified the hooked forewing that is orange-brown towards the apex and the dark splodge towards the hind end of the wings is surrounded by a creamy band. Along the apical half of the costa is a series of whitish streaks. CHRYSALIS: Forms a cocoon amongst leaf litter. BEHAVIOUR: It is active in the late afternoon into the evening, and inhabits a range of woodland and open ground biotopes. The larvae feed on Trifolium, Vicia, Lathyrus and Lythrum salicaria and spin leaves together to form a cocoon. HABITAT: Grasslands, woodland rides, waste ground and vegetated shingle. FLIGHT PERIOD: Two generations - April to May and then July to August. STATUS: Locally frequent in England and Wales but uncommon in Scotland and Ireland.